Is It Reliable and Flexible Website Builder Or Not? Over the last seven months, we’ve monitored the overall performance of Squarespace as a web host. We’ve tested out uptime, load time, customer support, features of the service, and more. Below is our in-depth squarespace review which relies highly on data. Squarespace was founded in CEO Anthony Casalena’s dorm room in April of 2003. These days, it’s much more than a dorm room operation. Headquartered in Maryland, the company boasts 827 employees across its three locations. Millions of websites are hosted on the Squarespace platform. In 2017, Squarespace was named the “#1 New York Based Employer Brand” by HIRED. The same year, the company was dubbed by Fortune as one of the best 50 places to work for parents, ranking at number 26 on the list. On their homepage, the brand claims to be “Trusted by the world’s best,” listing off several notable clients like Lyft and Airwalk. But is Squarespace really all it’s cracked up to be? In order to find out for ourselves, we created our own test site with Squarespace in May of 2018 (that can be found here). For those interested in raw data, see our public Pingdom page. Squarespace has a ton of perks, like solid uptime, support, and features. Here are all of the details. Our analysis of Squarespace’s uptime over the past seven months came out with an average uptime of 99.95%. Very respectable compared to many other web hosts. For more detailed uptime and speed data, visit our public page here. 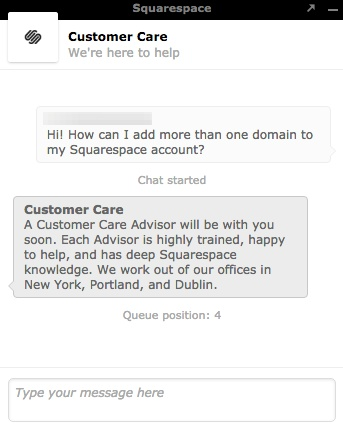 Squarespace offers extensive customer support, complete with a searchable knowledge base, a community forum, and webinars. They also offer live chat. 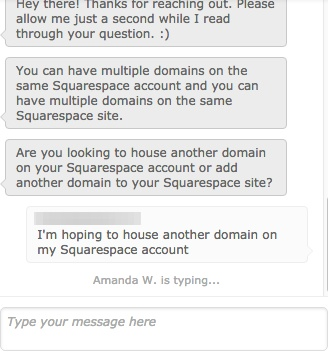 Before connecting users to a service agent, Squarespace automatically suggests knowledge base articles that might help solve your issue. If these suggestions don’t tickle your fancy, you have the option to either email the company or live chat with an agent (if live chat is open). Live chat hours are Monday through Friday, 4 PM to 8 PM EST. Two minutes later, I was greeted with a response stating that all other advisors are currently helping other customers and my message was placed in queue position number three. Fourteen minutes after reaching out, I was finally connected with an agent. Once connected, the agent was very knowledgeable and quick to respond. She was also very thorough and asked technical questions that could better help her understand my situation. At the end of our chat, she left with several resources and instructions that solved my problem. And she even threw in an extra tip or two, which I thought was pretty remarkable. It made the nearly fifteen minute wait time worth the hassle. Not fast by any stretch. I almost put it under the Cons below for that reason alone. 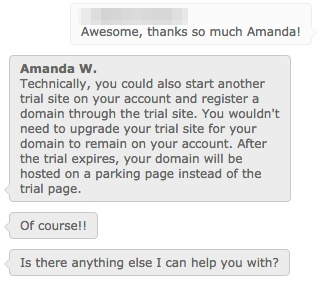 However, Amanda was so thoroughly helpful when she did connect that I’m leaving as a Pro for now. Squarespace offers a free custom domain name with the purchase of an annual plan. As long as you’re paying for their services annually, a newly registered domain name won’t cost you a thing. But if your website is already hosted elsewhere, Squarespace will charge you a fee to transfer it over. Or at least to pay for the top-level domain (TLD). Anytime a domain name is registered, you must provide personal information such as your name, address, phone number, and email address. All of this information is completely public with a simple WHOIS lookup. That’s just one of the ways that marketers or spammers find your personal information. WHOIS privacy protects the domain name owner’s information by replacing this personal with information from a forwarding service that masks the true domain owner’s identity. 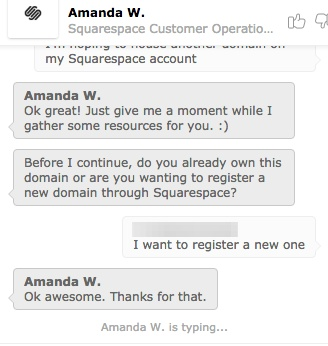 This feature is completely free when you register a domain with Squarespace. So is a SSL certificate, which stands for Secure Sockets Layer. This means that your site will begin with a secure “https://” rather than an unsecure “http://”, putting all of your visitors at ease that your website can be trusted. Squarespace isn’t just a hosting company, per se. It’s a fully-fledged website builder. 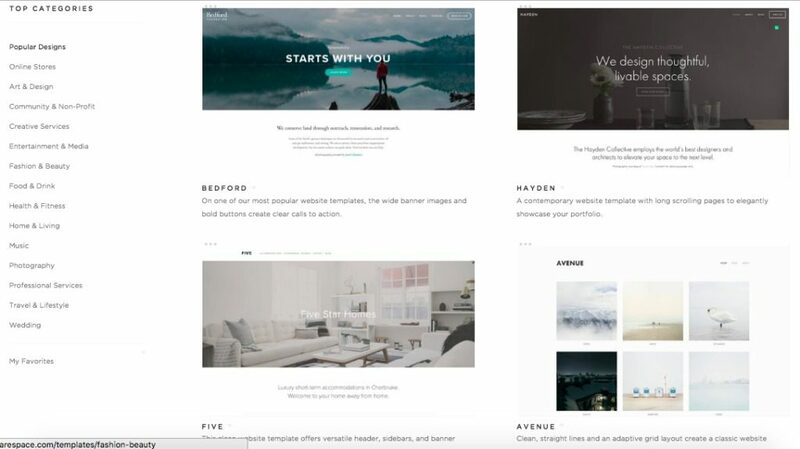 With Squarespace, there are tons of beautifully designed website templates to choose from. No coding or HTML is needed. You can even install multiple templates onto one site and run multiple designs simultaneously. Each template is completely customizable. You can select the fonts, colors, and page configurations that best fit your style. The best part? Each design automatically includes a mobile version that matches the overall design of your site, so your content will look great no matter the device that visitors are using. 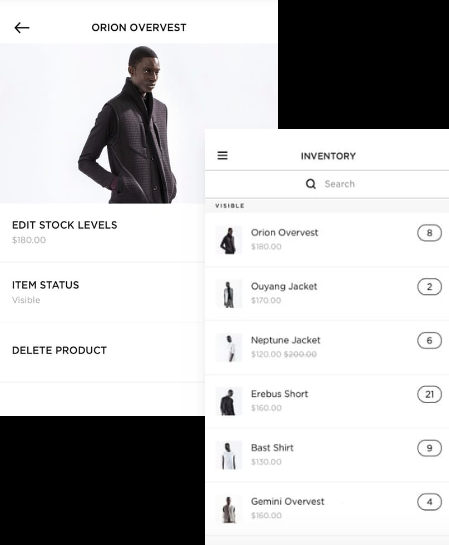 You can even create an online store with Squarespace, where you can add product catalogs, merchandise and manage your products, and remind customers about items they left in their cart. The online store features all come at an added price, though, which I’ll talk more about later on. Every rose has its thorn. And every web host has its downfalls. Despite all of the amazing things about Squarespace, there are a few red flags to think about before jumping the gun with this web host. We also tested Squarespace’s page load times during our 7-month review process. We found that their speeds were a bit slower than the overall industry average of 890ms, clocking in at an average of 955ms. This was pretty disappointing, to be honest. It’s like having an amazing car, that looks beautiful on the outside, but that keeps breaking down for silly reasons. A slow site is a useless site on today’s internet. Squarespace offers refunds, but you must cancel your subscription within 14 days of purchase. And that only applies to annual plans! The company doesn’t offer refunds at all for monthly plans. They also don’t offer refunds for renewal payments. When it comes to domain refunds, it gets even more sticky. 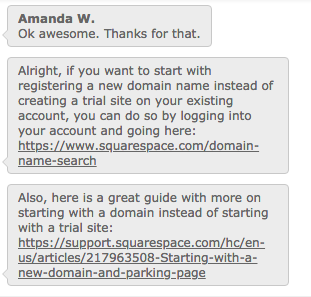 Squarespace only offers refunds to those who cancel domains within five days or registration. After that period, you’re basically screwed. If you register or transfer a .co.uk domain, there is no five-day grace period or refund available. Squarespace pricing is a bit misleading, just like most other web hosts on the market. They reel users in with a low monthly price of just $12 per month for the personal website plan. But that rate is for the annual plan, which will set you back $144 per year. If you truly want a month to month plan, you’ll have to shell out $16 each month, which comes to $192 per year. The same goes for the business plan. It’s listed as $18 monthly ($216 annually), but that’s for an annual plan. The month-to-month option is actually $26 per month, or $312 each year. Pricing for the online store features is set up in the exact same manner. The Basic online store plan is $26 per month billed annually, or $312. The true month-to-month one is $30 per month or $360 per year. The Advanced online store plan is $40 per month billed annually, or $480. The true monthly rate? $46 per month, or $552 per year. The bottom line? If you want a discounted rate, you’ll have to commit to Squarespace for one whole year at the minimum. Here’s a quick overview of the hosting plans that Squarespace offers. Free domain? With an annual plan. Hidden Fees and Clauses: Refunds aren’t available on monthly plans or renewal payments. There is a $20 to $70 fee to transfer an existing domain. Control Panel and Dashboard Experience: Dashboard. Installation of Apps and CMSs (WordPress, Joomla, etc. ): One click install for most CMSs and popular apps. Squarespace has knowledge base articles explaining how to install most supported integrations. Squarespace is packed full of features, and they’re a giant in the web hosting world. They offer tons of sophisticated features, including an intuitive website builder that comes with modern templates and e-commerce options. Each design is optimized for mobile, too. Those who sign up for the annual plan will receive a free domain, and WHOIS privacy and SSL are included with all plans. But Squarespace’s speeds are pretty slow, which is a huge deal. If your site visitors are hit with slow speeds, they might bounce. Their refund policy is also a bit wonky and disappointing, and pricing is misleading. You’ll have to commit to them for a year if you want to get the lowest rate, no matter the plan you choose. If you’re interested in seeing which hosting providers ranked above Squarespace, take a look at our top performing hosts here. Or, if you want to take a quick look at how other website builders are doing then we have covered that as well. Do you have any positive or negative experience with Squarespace? Leave a transparent, authentic review below!